350 | Stand in Solidarity - Stop the Tar Sands! Stand in Solidarity - Stop the Tar Sands! If you've already signed the petition please Post it on Facebook, Share It On Twitter, and send a solidarity message and photo to people protesting in DC. It's time to take a stand against the Keystone XL pipeline, a dangerous and destructive project that would pump over one million barrels of dirty "tar sands" oil from Canada to the USA every day. The oil in the Keystone pipeline could poison drinking water, threaten the communities it runs through, and wreck the climate. But there's good news: the Keystone XL pipeline cannot be built without a "presidential permit" from the Obama Administration. 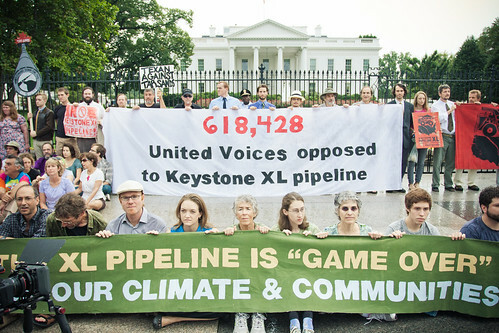 Let's turn up the pressure to make sure President Obama rejects the pipeline. The clock is ticking: the State Department has said it will make a final decision on whether or not to issue a presidential permit deeming the pipeline in our "national interest" by the end of this year. We know more pollution and more climate change are not in any nation's interest, so we’re calling on President Obama to step up and display the kind of lead. Please sign on today by filling out the form in the box on the right. "The tar sands represent a catastrophic threat to our communities, our climate, and our planet. We urge you to demonstrate real climate leadership by rejecting the requested permit for the Keystone XL pipeline and instead focus on developing safe, clean energy."